If you are a marketer, you must have spent hours figuring out the best practices that will trigger lead activation and create conversions for your brand. You have gone over all the said practices and traditional guidelines. It is likely that you are also focusing on creating educational content, planning out promotions for your content and also budgeting for paid ads. But what if creating a content strategy is not the only thing you should be worried about? You might roll your eyes at what I will say next, but what makes a content strategy successful is SEGMENTATION. And here I am talking about dynamic segmentation. Static segmentation is not out of the league, but it requires a lot of list building activities which can be a challenge given that your lead behavior is constantly changing. When you create a paid ad on social media or search engine, there is an influx of leads into your marketing-sales funnel (I am consciously using marketing and sales together because we both know how important marketing-sales alignment is for a business to thrive!). These leads are mixed leads- some leads are genuinely interested in your brand, some are just browsing around, and some are unqualified leads. Dynamic segmentation helps in segmenting these leads into specific buckets based on the pre-set criteria. Based on your business type and ideal buyer’s persona, you can create demographic segmentation, location, buyer’s stage, lead source, current activity, browsing patterns, and more. This is your first round of dynamic segmentation that happens immediately after your potential leads enter your marketing-sales funnel. What follows is a series of nurturing and retargeting campaigns that include various forms of content. Each lead has specific interests and requires personalized nurturing. This personalization can be done only when dynamic your segmentation continues to update as and when your leads take any action. It can move forward in the funnel or go backward as well. While each form of content triggers an action, each action makes way the next nurturing content. You can imagine it like a loop – one thing leads to another in a continuity. 50% of companies have more than three market segments. 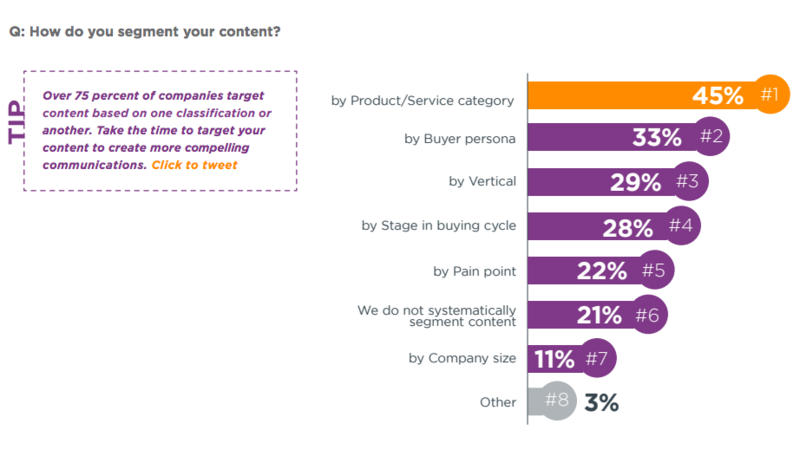 47% of companies have three or more buyer personas. 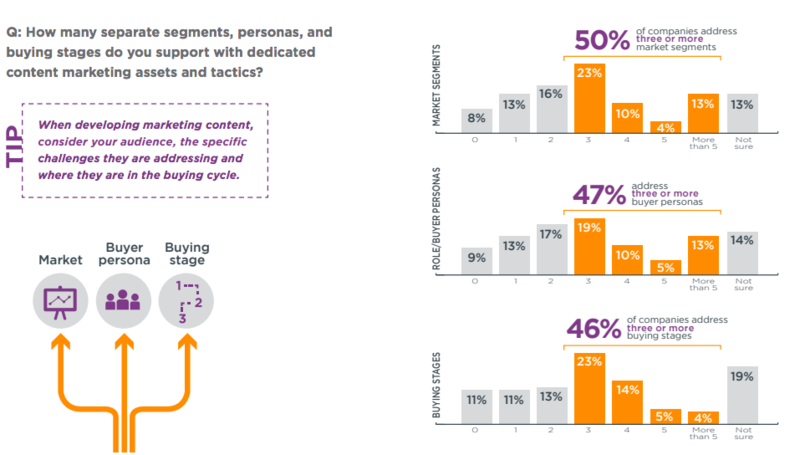 46% of B2B companies address three or more buying stages. Yet content marketing effectiveness relies heavily on sending the right content to the right person at the right time. And the core functionality that drives this is proper market behavioral segmentation, followed by dynamic contact segmentation. To understand the impact of behavioral segmentation, website activities, personas, social activities, and other such factors, first, let us consider a hypothetical situation (we will ignore the additional challenges or intricacies of such situations to look at the bigger picture). You have segmented your target market and have created your first paid ad. It can be a social media ad or a paid search engine ad against a relevant long-term keyword. Both these ads are different from each other. Hence the dynamic segmentation will happen differently. The social media ad can give you impressions, clicks, trigger in-message communication, and social media page activity, bring the visitor to your dedicated landing page, and then this visitor either becomes your lead directly from the landing page or get redirected to the main website or product page, wherein it gets converted to a potential lead. In this entire navigation flow, you will require two forms of content – one for your ad, which has to be crisp yet informative about what you are showcasing; the other is the landing page which will act as a gateway to your website. While framing your content, you need to keep in mind the consistency in your choice of words, design elements, content placement, and message to maintain consistency in user experience throughout the process. The visitor completes the whole flow and becomes a lead. The visitor leaves mid-way or leaves without converting into a lead despite reaching up to the main website or product page. Based on the stage in which the visitor is, the first set of segmentation will happen within your marketing automation tool. If your visitor becomes your lead, then you can start with nurturing campaigns based on its buyer’s stage. However, if the visitor continues to remain anonymous, you can retarget it with more relevant content, track its behavior with the help of demographic segmentation and browsing pattern, and create more targeted content. The first search result is an ad from LinkedIn, clicking on which will take you to the LinkedIn marketing solutions page to create LinkedIn ads. This page contains all the details and CTA buttons for a new visitor to get started from here. What kind of dynamic content you will send when you will send, and how many times you will send – all these depend on lead activity and proper dynamic segmentation. If your contacts are not segmented automatically based on all the minute changes that happen in their buying stages or personas, you can never build a content marketing strategy that will leverage your overall ROI. 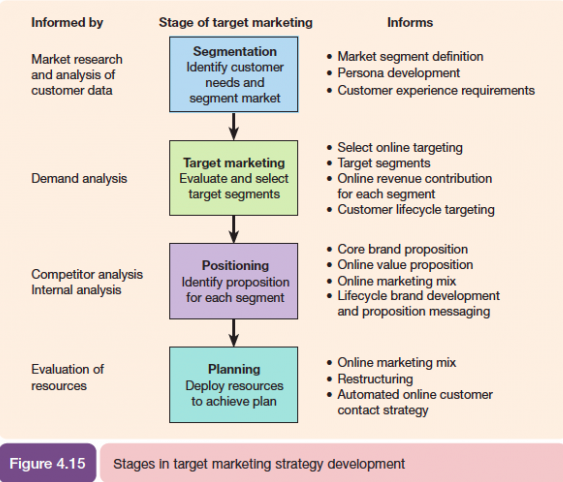 Below is a visual showing how dynamic segmentation, targeting and positioning impacts a B2B digital marketing strategy. Digital marketing is encompassing new channels to connect with the target audience on a personal level so that they can create better segments for higher engaging automation campaigns. You HAVE to know more about your target audience to design relevant contents and create appropriate marketing campaigns. Awareness: When your lead is just starting to understand their problem statement. Consideration: In this stage, your lead knows what problem it has and is now looking for optimal solutions. Decision: It has gone through a series of solutions and is about to zero-in on one. Conversion: The final decision is made and your lead now signs up for your product/service. Delight: Retain your customers because they will bring 80% of your business. And how? By converting them into your loyal customers. Awareness: Whitepapers, Ebooks, kits, tips, checklists, How-to-webinars, how-to-guides, etc. Consideration: Product webinar, case studies, FAQs, data sheets, demo videos, etc. Decision: Free trials, live demo videos, coupons and offers messages, etc. Conversion: Welcome messages, onboarding series, support campaigns, product feature explanations, new updates, etc. Delight: Referential programs, affiliates, surveys and giveaways, social contests, etc. 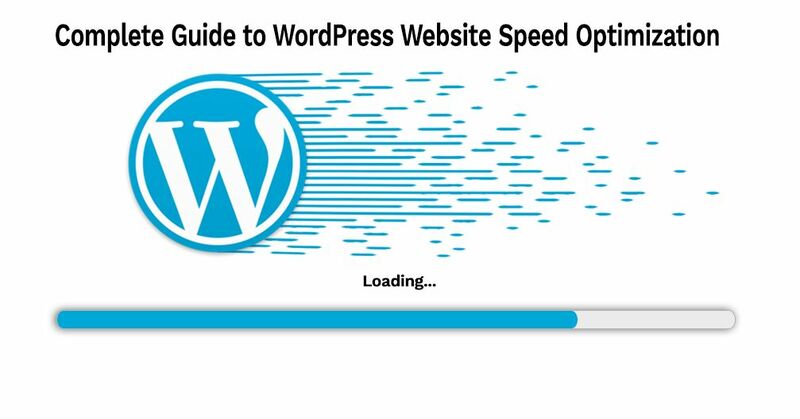 There are endless forms of content that aid a business to trigger more conversions. However, it all depends on the criteria that you define for your dynamic segmentation and the kind of nurturing campaigns you want to run for your users. Some brands focus more on social media marketing, while others drive traffic only through organic marketing. Then, there are brands who rely most on video marketing or maybe data and charts. Every business has a different need and different set of audience. What kind of content will work depends on your business proposition, but there is no choice on whether you need dynamic segmentation or not. Because YOU DO. To send targeted messages and build brand awareness, behavioral segmentation is the first and most important feature to start with. Thank you very much for this super insightful and well thought out article. Thanks again! An interesting article you have written here. Any marketer should follow these dynamic audience segmentation strategies. Thank you! Great article! This is an excellent guide to get started with dynamic audience segmentation. Thank you for sharing this modern marketing ROI scenes, and I also think that statistics that prove business market segmentation need advocacy.